My dress, with its strong color, clean lines and feminine silhouette, has all the elements that have become a part of the trademark style of our first lady. To help luxury lovers stay informed on the latest in upscale style and Hollywood happenings, Rodeo Drive Resale (http://www.shopRDR.com), premier reseller of 100% authentic St. John Knits, Louis Vuitton handbags, and Tiffany & Co. accessories, looks at the latest happenings in the world of upscale fashion and celebrity style. MICHELLE OBAMA, BY MICHAEL KORS: “Mrs. Obama looked chic and elegant as always on Election Night,” Famed designer Michael Kors said in an email to the Associated Press. “My dress, with its strong color, clean lines and feminine silhouette, has all the elements that have become a part of the trademark style of our first lady.” The First Lady donned a Michael Kors magenta silk chine pin-tucked dress on Tuesday, November 07, 2012, as she joined her husband onstage as he celebrated his presidential victory. Michelle, not one to let a good piece go to waste, has worn the dress twice before. ST. JOHN KNITS ANNOUNCES BIG SALE: Fashion favorite St. John Knits recently announced a special sale, big savings off select fashions. The campaign is being offered online and off. 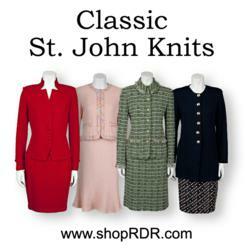 St. John lovers that prefer the more traditional look of the iconic label are invited to visit shopRDR.com, the world’s largest reseller of St. John Knits. There, shoppers can find classic pieces from the label’s collection, all guaranteed authentic and offered at an amazing price. Shoppers can find these brands and more at shopRDR.com, a leading online reseller or quality luxury labels. Rodeo Drive Resale (shopRDR.com) has built a reputation of providing amazing deals on handbags, clothing and accessories from the top designers of upscale fashion. The company offers a 100% guarantee of authenticity on each item sold, and works daily with a network of clients looking to buy, sell, or for consignment of their luxury goods. ShopRDR.com loves high-end fashion, and believes finding a high quality, classic piece should be an easy, enjoyable -- and most importantly -- hassle-free shopping experience. For the finest in Louis Vuitton, Chanel, Prada, Gucci, St. John Knits, Christian Louboutin, Tiffany & Co. and more, visit RDR online at http://www.shopRDR.com or call 1-888-697-3725. Also find shopRDR.com’s blog at http://blog.shopRDR.com.